Opened to the public in June of 1923, the Los Angeles Memorial Coliseum can arguably be called "America's Most Historic Sports Stadium." In 1984 the Memorial Coliseum was declared a State and Federal Historic Landmark for its contributions to both the State of California and the United States. The history of this institution is captured here in over 200 vintage images. The Memorial Coliseum's history spans eight decades, playing host to two Olympiads, two Super Bowls, one World Series, a multitude of concerts and political rallies, a Papal mass, and one of the most famous Democratic presidential nomination acceptance speeches of the 20th century by John F. Kennedy. 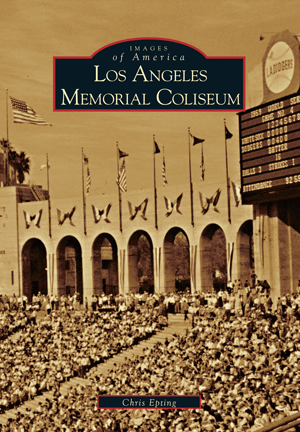 Using photographs culled from its archives, pictured here are never-before-seen photographs of the Coliseum's construction; rare images of political and religious rallies held at the Stadium and the Los Angeles Sports Arena, and home to famous speeches by Franklin Roosevelt, Martin Luther King Jr., and Nelson Mandela; and a myriad of other sporting and entertainment events hosted by the Memorial Coliseum, including the Los Angeles Dodgers, motocross racing, and the Rolling Stones. Chris Epting is an advertising executive with a keen interest in sports of all kinds. He is the best-selling author of another pictorial history with Arcadia Publishing, Huntington Beach, California.